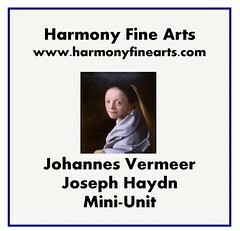 These easy to use art and music appreciation plans are waiting for your study of Vermeer and Joseph Haydn! This mini-unit was written so children of all ages can participate in art and music appreciation in your family. Viewing great paintings and listening to Haydn’s music are both appropriate activities for all members of your family. This ebook plan is available for $3.95. I have written the plans in such a way that you don’t need any additional resources if you are on a limited budget. If your circumstances allow, the one resource you might consider purchasing is the CD for listening to Haydn for the nine weeks outlined in the plans. This mini-unit can be used at any time of the year and is not seasonal in theme. My mini-units are written so you can pick and chose when to study and how to study each artist and composer featured. The plans are flexible enough that you can use them with all ages of children in your family. The great thing about ebooks is that you purchase once and then you can use them multiple time and they are not consumed. You can print the notebooking pages and prints as many times as you need to for your family. was the movie The girl with one pearl earring true to life??? i always wondered but did no research! I remember reading somewhere that the author who wrote the book that the movie is based on used a skeleton of facts to build the story.I have not read the book but I have seen the movie. If you do a quick Google search I am sure you can find the facts that are true about the movie. Just wanted to say that the movie (Girl With The Pearl Earring) is not for children without previewing by a parent. I do not suggest it in the plans. Quick question what age group are your units geared too? My favorite artist is Vermeer so I am very interested in this unit. My children are 6 and 8. Can I gear it to them? I love the look of it! I can’t wait to get to it! All of my mini-units are written so you can be flexible and use one plan for all ages. Viewing artwork is appropriate for all ages and the follow-up activities can be done as they would fit your child’s interests and abilities. Listening to the musical selections would also be appropriate for all ages of children. There are several choices for notebook pages, some that even younger children can complete. Hope that helps. I will add this info to the post. Thanks for asking. We have just started this mini uinit and I already love it! I did find something that may add to the studies- If you use NetFlix, they have:”The Great Artitsts:The Dutch Masters: Vermeer”. We watched it today,it was very well done. Thanks for the tip about the Netflix movie!